DARLING NYC Opening Night – PICS! Last night, DARLING opened in NYC’s Village East Cinema, followed by a cast Q&A moderated by Entertainment Weekly’s Clark Collis! Click right here to check out a gallery of pics from the evening. Filmmaker Mickey Keating’s deft fest hit is an indie horror landmark. It’s not what you have. It’s not the colors in the pallete. It’s not the government funding. It’s not the marketing. Art is none of these things. No, art is simply the reflection of the artist, authentic and true and brave and bold and alive and visceral. Art is using whatever you have at your disposal to project the dreams and nightmares and hopes and fears and horrors and truths and fantasies you want to share in ways that are pure. In ways that are yours, unique to you. The movie we’re chiefly here to discuss today, right now…It’s an immaculate work of art and one of the most affecting horror movies I’ve ever seen. As you already know, that picture is director Mickey Keating’s poisonous psychodrama DARLING, a movie that breaks rules and is filled with so much innovation and such daring, deceivingly simple vision, that I actually yelled out loud as it un-spooled, shouting in excitement and a joy stemming from the revelation that the people that made it were not only making an auteur horror movie that was progressive and meaningful, but that a third party was backing the movie, distributing it and ensuring that people saw the movie and knew it existed. DARLING. Sweet, horrible, savage DARLING. Imagine early incarnations of David Lynch, Roman Polanski, Lars von Trier and Guy Maddin on a three day meth bender in one of Stanley Kubrick’s suites at The Overlook Hotel and you’ll get a sense of DARLING’s mission statement. Made for very little money with a skeletal cast on spare locations (primarily a looming house in what I think might be upstate New York), DARLING casts the doe-eyed Lauren Ashley Carter (JUG FACE) as an obviously disturbed girl who accepts a position as the caretaker at posh mansion owned by an elegant, icy and presumably wealthy woman (BLADE RUNNER’s Sean Young, looking great and a welcome presence back on the screen). Like Jack Nicholson’s Jack Torrance at the aforementioned Overlook in Kubrick’s impossibly influential THE SHINING, it’s clear that Carter is crackers from frame one. But considering the home’s haunted history, it’s a given that she’ll go even madder as the movie progresses. And she does. 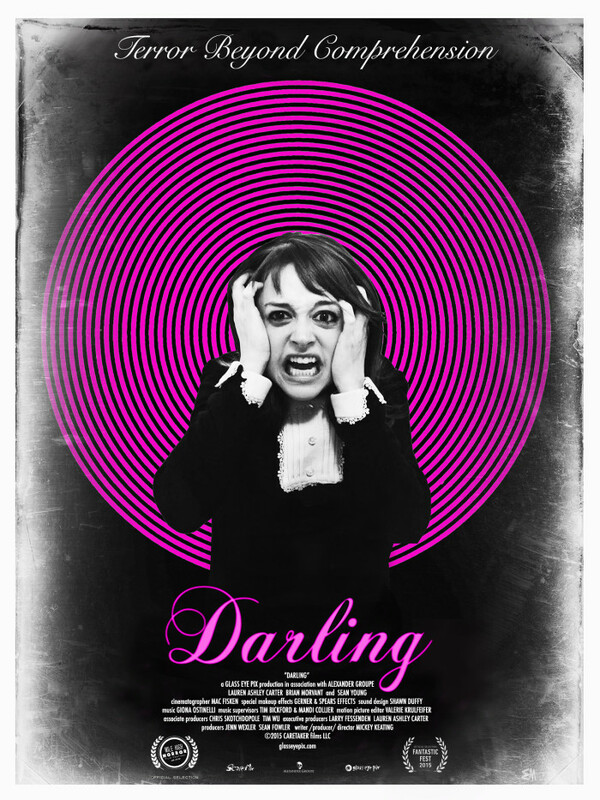 DARLING is co-produced by the great Larry Fessenden, who also appears in the film, a product of his Glass Eye Pix, a company that almost always makes interesting, modestly budgeted and wholly original horror films. But here, backing Keating’s vision, they may have made their first real deal masterpiece. DARLING is a perfect movie in its imperfection. It’s a movie that bends rules and defies expectations and always remains a messy, personal primal scream of a picture. It’s most assuredly a work of dark, seething art and, as the hyperbolic headline of this review screamed, it’s the best horror movie of 2016. But I can’t imagine it will get any better than this. Look for DARLING when it opens theatrically and on VOD on April 8th. Check out the full review on ShockTillYouDrop.com. After a weekend of negotiations following its Fantastic Fest premiere on Friday night, Screen Media Films has landed worldwide acquisition rights to Mickey Keating’s “Darling,” starring Lauren Ashley Carter, Sean Young, Larry Fessenden and Brian Morvant. “Darling” stars Carter as a young woman who goes crazy after taking a caretaker job at an ancient home in New York. The deal was negotiated by Needle at Screen Media, with Bill Straus of newly formed Bridge Independent on behalf of the filmmakers. Screen Media Films will release the film in theaters in early 2016. Written and directed by Mickey Keating, whose POD just saw release (see story here), DARLING stars JUG FACE’s Lauren Ashley Carter as a young woman who takes a job as a caretaker in a mysterious Manhattan mansion, where the last person to have the job committed suicide and her own sanity begins to crumble. The cast also includes Brian Morvant, Sean Young, Larry Fessenden, John Speredakos and Helen Rogers, and the film was produced by Fessenden, Jenn Wexler, Sean Fowler, Keating and Carter. For the full post and an exclusive image, head to Fangoria. Ain’t It Cool News is reviewing the new season of Tales From Beyond the Pale, and this week their review focuses on Kim Newman’s “Sarah Minds The Dog” and Glenn McQuaid’s “The Crush”. Head to AintItCool.com to check out the whole post. JUG FACE, featuring Fessenden alongside Lauren Ashley Carter, Sean Bridgers, Sean Young, and Daniel Manche, is coming to DVD and Blu-ray this October! Masters of Horror: ‘Tales from Beyond the Pale’ returns! “On Friday the 13th, those Masters of Horror, Larry Fessenden and Glenn McQuaid released the second season of their excellent, radio drama series Tales from Beyond the Pale. Tales… follows in a similar tradition to E.C. Comics Tales from the Crypt, or those wonderful portmanteau horror movies produced by Amicus Productions in 1960s and 1970s, Doctor Terror’s House of Horrors, Torture Garden, The House That Dripped Blood, Asylum and Vault of Horror. Simon Barrett unleashed a trio of masked killers on an unsuspecting family — and moviegoing public — as the screenwriter of the current horror film You’re Next, and next month he puts a college DJ through hell in old-school Hollywood fashion.